I started a scraps-only leaders/enders project in the fall of 2017. I simply paired 2.5" squares with 2.5"x 4.5" rectangles. I cut my scraps into these sizes as I went along making different projects and sometimes I simply dedicated some sewing time simply to rifle through my scraps and cut them to size. This quilt contains a lot of scraps from my craft fair projects, gifted quilts, my recent patchwork swoon finish, and many others. I love how many "memories" it contains. The finished quilt measures about 90" square. I took photos of this finish at a cabin in Fairplay, CO- it's always good to use a unique photo setting if it's available. We had a mini-family reunion with Nick's side of the family- we really had a great time even if I did miss my sewing machine while I was away. My kids are drawn to newly finished quilts and I love it! It's not easy to see, but I quilted this on my longarm with simple loops. A scrappy quilt is always a great opportunity to use up that hard-to-use yardage one might find in their stash. The butterfly print was a 5 yard purchase I made very early in my beginner quilting days. If I found something I liked, I bought an excessive amount of it - most of it in the rainbow variety. I bound this quilt in a colorful ric-rac chevron print I've had for ages. This quilt is definitely a keeper and I've already started a leaders/enders scrap quilt that's fun and going much fast than this one. 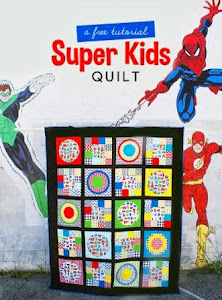 Linking up to Crazy Mom Quilts for Finish it up Friday. Love the quilt. Scrappy quilts are my favorite. Beautiful quilt! Very simple construction but so very high impact! 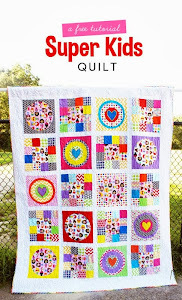 Scrappy quilts are my favorite too! That is a great leader and ended finish! Love your quilt. I am prepping scraps for a similar one. I had't thought about what size to make mine I was just going to sew scraps together until I thought I was done. It will also be a long term project for me.